Zero Hour! has an unfortunate claim to fame - it was one of the films that the spoof comedy flick Airplane! was based on. However, the film still packs a punch, and manages to create a palpable feeling of tension as it follows the exploits of a plane full of passengers and crew who succumb to food poisoning. The unfortunate incident leads to a desperate search for someone who can fly the plane to safety. While most movie parodies take a broad approach, 1980’s Airplane! went for a tighter target. 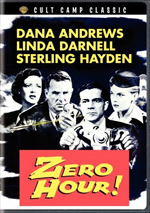 Though the flick encompassed a few other influences, it mostly acted as a goof on 1957’s Zero Hour!. With that as background, I wanted to take a look at Zero itself. A prologue shows us an air attack conducted by the Allies against Germany during WWII. Squadron leader Ted Stryker (Dana Andrews) sees weather lead his operation toward tragedy, as six of his men crash and die. Stryker receives physical injuries but suffers more due to the mental anguish his bad decision leaves with him. We then leap to Canada circa 1956 and we see that Stryker can’t keep a job due to his mental instability. He also has marital woes so his wife Ellen (Linda Darnell) splits and takes their son Joey (Raymond Ferrell) with them. Stryker chases after them, which means they all end up on the same plane despite Ted’s fear of flying. As that soap opera plays out, disaster strikes. Some of the passengers – and both pilots – eat bad fish that gives them severe food poisoning. With no one left to fly, matters turn dark – and only Stryker can come to the rescue! Boy, does it become tough to watch Zero without feeling the effects of Airplane! I’m no fan of that comedic affair, but I know it well enough to make sure that I can see the many parallels between the two flicks. Airplane! doesn’t offer a perfect recap of Zero, of course, as the spoof only borrows certain parts of the earlier film. That’s more than enough to ensure it becomes absolutely impossible to take Zero seriously. Not that this task would be easy even without the later spoof. Zero is a melodramatic, over the top piece of “B”-movie cheese without much going for it. Oh, I like the concept, even if it does borrow heavily from 1954’s The High and the Mighty. And unlike that John Wayne effort, Zero movies at a good pace. At 81 minutes, it zips by quickly and doesn’t dally on pointless subplots, whereas Mighty consists of almost nothing but pointless subplots. A good concept and a short running time aren’t enough to create a fine movie, unfortunately, and Zero suffers from too many other concerns to succeed. We get plenty of weak dialogue and staccato, jerky performances. The director seems more concerned with zooming through everything than with actually telling a story, so there’s precious little depth on display. This is a cheesy, cartoony affair from start to finish. But I suppose fans of Airplane! owe a debt to Zero Hour! since without it, they might never have gotten their beloved 1980 spoof. Since I don’t like Airplane!, I can’t come up with many positives to associate with Zero. I’ve seen worse movies, but this one remains a goofy piece of melodramatic silliness. Zero Hour appears in an aspect ratio of approximately 5:1 on this single-sided, single-layered DVD; the image has been enhanced for 16X9 televisions. The flick occasionally showed its age, but it usually looked pretty good. Very few issues with sharpness materialized. Only a smidgen of softness ever interfered with occasional wider shots. Otherwise, the movie remained nicely crisp and distinctive. Jagged edges and shimmering caused no concerns, and edge enhancement was minimal. As one might expect of a 50-year-old film, source flaws crated the primary distractions. I noticed sporadic examples of small specks and marks. These never became heavy, though, as they popped up infrequently. The only major defect appeared at the 31:32 mark, as a large tear ripped through the frame. Blacks looked deep and firm. Shadows were smooth and clean, while contrast seemed quite strong. Overall, I really liked this nice presentation. As for the monaural audio of Zero Hour!, it worked fine for its age. Speech always seemed concise and natural, with no edginess or other distractions. Music lacked much range but came across as clean and acceptably bold. Effects showed decent heft and also boasted nice clarity; the track came essentially free from defects. This was a perfectly solid little mix. Unfortunately, the DVD skimps on extras. It comes with the movie’s trailer and that’s all. 50 years after its release, Zero Hour! is best remembered as a cinematic footnote due to its status as the movie that inspired a famous spoof. Without that Airplane! connection, though, there’s nothing substantial to discover in Zero. It’s a cheap and silly affair without much merit. The DVD presents pretty good picture and audio but skimps on extras. Airplane! fans will want to give this one a look just for historical purposes, but I can’t recommend it to anyone else.